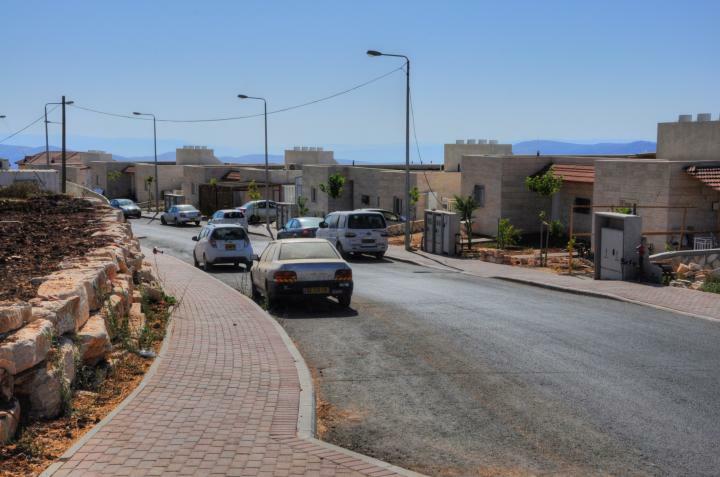 A communal village located on the south side of Mt Gerizim in Samaria. The community of Har Brakha (Hebrew: "Mount of Blessing") is located to the south of Mount Gerizim, just a few kilometers south of Shechem (Nablus). There are about 300 families (2012) residing in the communal village. The village is located on a hill, 879m above sea level. It is 1km southwest of Mt Gerizim archaeological park and the Samaritan neighborhood of Kiryat Luza. The access road ascends from the Michmethah valley, south-east of Har Brakha. Har Brakha ("Mount of Blessing") refers to Mount Gerizim, a hill located on the south side of Shechem (today's Arabic city of Nablus). On the opposite side of Shechem is Mount Ebal. Both of these hills witnessed the mass ceremony held by Joshua after his entry to Canaan, following the return of the Israelites from the Exodus in Egypt. The ceremony took place according to the commands Moses received earlier from God - to gather the people between the two facing hills - Gerizim and Ebal - and bless the former while cursing the latter. Why did one mountain receive a blessing, while the other was cursed? 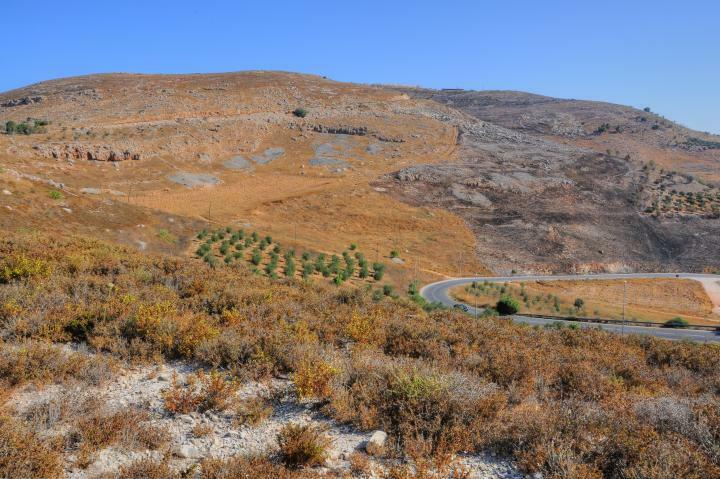 Mount Gerizim faces Shechem on its northern side, and is therefore greener. Mount Ebal, on the other side, faces the sun on Shechem's side, and is therefore dry and arid. This perhaps gave Gerizim the perception of being the fertile mountain, and was credited with being blessed. After 1967, the army established a military post on the hill south of Mount Gerizim. In 1983 it was converted to an Orthodox Jewish community. In 2012 there were about 300 families living here. In 1991 a Yeshiva (Jewish educational institute) was built here, which contributed to the rapid growth of the village. The community is located to the south of Mount Gerizim, which is the Biblical "mount of the blessing" (Hebrew: Har Brakha). The southern view below shows the ascent to the community, located on the top of this hill. The village, one of the West Bank Jewish settlements, was established as a residential place in 1983. 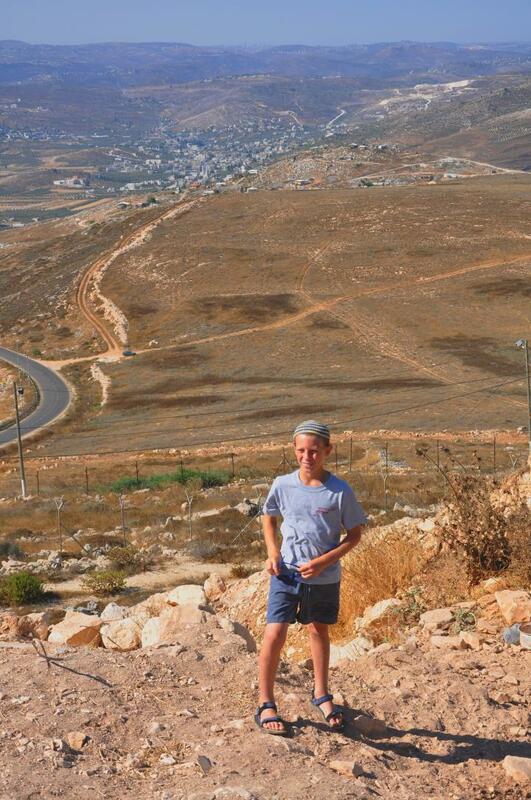 It was formally a military outpost that overlook the southern entrance to Shechem. There are 300 families here (2012), most of them in their 30s. We stopped by to chat with the settlers. They were keen on discussing their life in the area, and explained their presence here with zeal. As you can see in the picture below, this smiling family presented us with fruits, advices and offered assistance in travelling around the village. This was one of the warmest encounters we have ever had while walking thru the Holy Land! The young member of the family is seen here on this southern view. 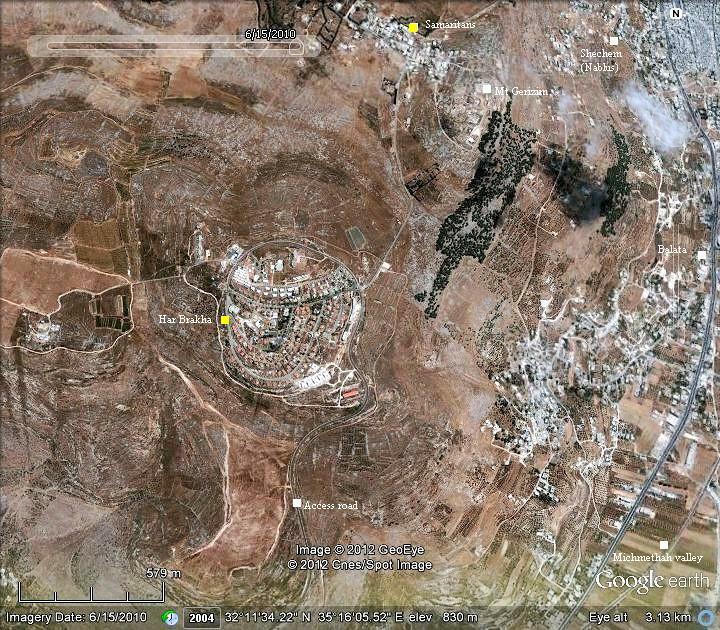 The Arab villages of Huwarah (center), Burin (hidden right) and Awertah (left) are the closest villages on this side. The Arab villagers are hostile to the settlers or the travelers on the roads. There are frequent cases of terrorist attacks, with many casualties in the past years. The Army has check posts along the roads and is trying to control the tight situation. Like the two mountains, this Land is both blessed and cursed. 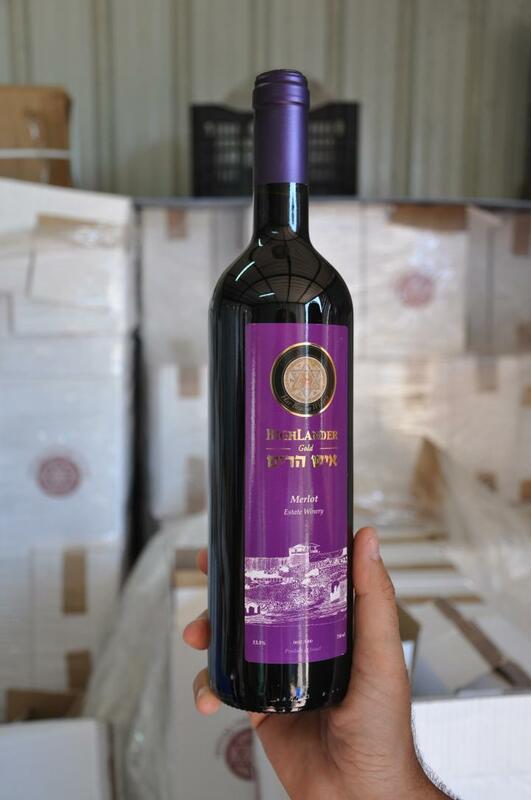 One of the sources of income - and pride - of the settlers in Samaria is the production of quality wine. The grapes that are grown in the hills of Samaria enjoy the warm days and cool nights, which make a good recipe for good wines. A small winery was established here in 2007, which produces 3,000 bottles (2011 figure) of Cabernet Sauvignon and Merlot wines. This winery is termed "estate" since 100% of its wine is produced from grapes are grown on the land owned or owned by the winery. A bottle of the Merlot wine is shown below. 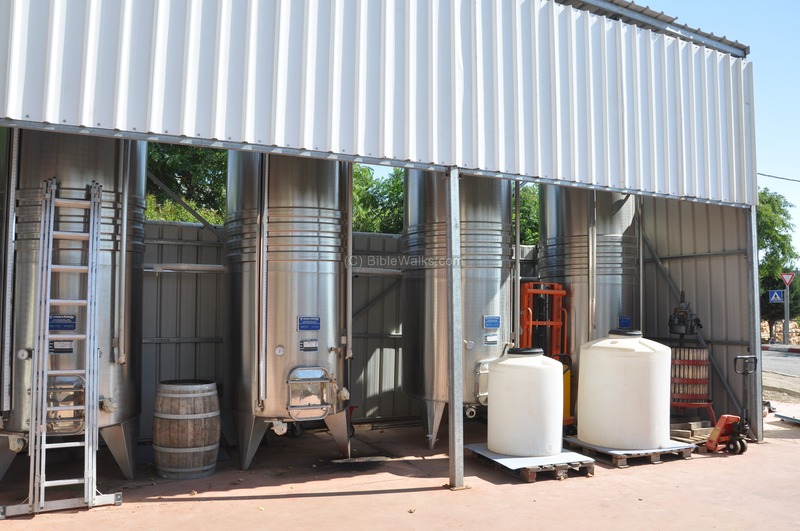 The winery is now expanding the areas of the vineyards and is adding more types of wines. The owner also told us that Christian Evangelical volunteers come here every year to work in the vineyards. 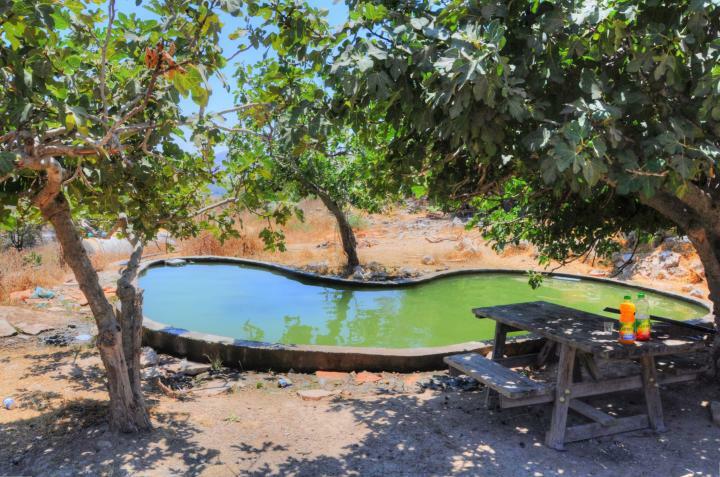 For the visitors, growing grapes and producing wine in the Biblical landscape is a rewarding experience. However, this is a unique phenomena since the majority of this Jewish community are religious, and some extremists naturally resist this presence in their neighborhood. A pair of pools are located on the side of the lower side of the access road. A set of picnic tables and the shade provide a perfect place to take a short break and dip into the cool water. The following panoramic viewers show larger field of views, with indication of major points of interest. If you press on one of the pictures below, a panoramic viewer will pop up. You can then move around, view in full screen or zoom in or out. Note that it might take some time for the download. The first panorama was taken 2km south of the village, with a view towards north and east. The second panorama was taken from the top of the village, with a view towards the south-east and south. "And Moses charged the people the same day, saying, These shall stand upon mount Gerizim to bless the people, when ye are come over Jordan; Simeon, and Levi, and Judah, and Issachar, and Joseph, and Benjamin: And these shall stand upon mount Ebal to curse; Reuben, Gad, and Asher, and Zebulun, Dan, and Naphtali. And the Levites shall speak, and say unto all the men of Israel with a loud voice, Cursed be the man that maketh any graven or molten image, an abomination unto the LORD, the work of the hands of the craftsman, and putteth it in a secret place. And all the people shall answer and say, Amen. Cursed be he that setteth light by his father or his mother. And all the people shall say, Amen. Cursed be he that removeth his neighbor's landmark. And all the people shall say, Amen. Cursed be he that maketh the blind to wander out of the way. And all the people shall say, Amen. Cursed be he that perverteth the judgment of the stranger, fatherless, and widow. And all the people shall say, Amen. Cursed be he that lieth with his father's wife; because he uncovereth his father's skirt. And all the people shall say, Amen. Cursed be he that lieth with any manner of beast. And all the people shall say, Amen. Cursed be he that lieth with his sister, the daughter of his father, or the daughter of his mother. And all the people shall say, Amen. Cursed be he that lieth with his mother in law. And all the people shall say, Amen. Cursed be he that smiteth his neighbor secretly. And all the people shall say, Amen. Cursed be he that taketh reward to slay an innocent person. And all the people shall say, Amen. Cursed be he that confirmeth not all the words of this law to do them. And all the people shall say, Amen". Har Brakha - Hebrew: Har - Mountain; Brakha - Blessing. Refers to Mt Gerizim, the mountain which received the blessing. 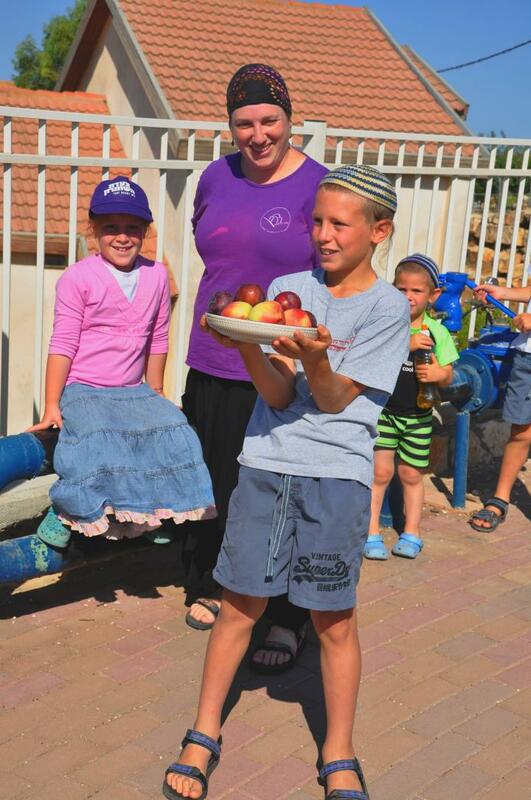 Kiryat Luza - the name of the Samaritan village, north of the community. Based on the Arabic name of the ruins: Kh. Lozeh.